This is Rusk, who is another bear in our Bread and Biscuits collection. He is 3 1/2" tall (ignoring those ears!) 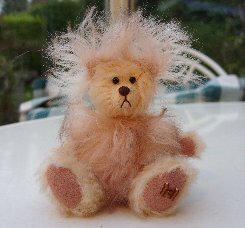 and is made of pale peach German mohair, with his tummy and ears made of beige German mohair tipped in dark brown. As you can see, this fur is much longer and also has a wave in the pile which gives Rusk his wonderful fluffy tummy and amazing ears! We have given him pale tan ultrasuede pads and paws, a small dark brown stitched nose which has been varnished with a matt varnish. Rusk also has shiny black English glass eyes and a pale beige belly button. He is steel shot filled for weight and has a big personality for such a small bear! I do hope that you like him, I think he's adorable. I particularly like his small nose which is quite round. He costs £35 plus postage. Please note that as with all our bears, Rusk is not a toy and is not suitable for children. Sorry - Rusk has been adopted.